A vibrant collection of multi-colored millefiori glass beads, that is beautified with luscious colors & creative designs. These beautiful millefiori glass are hand processed into many colors and shapes as jewelry supplies. Size : 12X31mm. 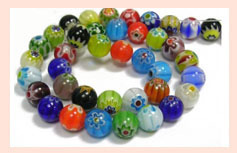 The range of Lampwork Millefiori Beads that we manufacture and export is very attractive. Available in various shapes and sizes, these Lampwork Millefiori Beads can add elegance if embellished in handbags, attires or barrettes. An exotic range of venetian millefiori beads, that is available in attractive designs and patterns. Millefiori venetian beads that eloquently speak about the dexterity and artistry of our master craftsmen. With rich industry experience, we are offering our clients a wide assortment of Venetian Beads (Miliforia Beads) which is actually modern embodiments of the oldest bead art. These are offered to our clients in various shapes, sizes and colors as per the requirement of our valuable clients. 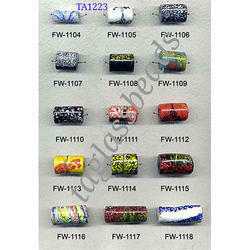 Our range of these beads is widely used in creative beading projects. We specialize in the manufacture of a wide range of millefiori beads that is available in attractive designs and patterns. Clients can avail square, cylindrical and round shapes of millefiori beads in various colors. These beads are elegant pieces of art and reflect the skills of our artisans.